Blue is a blue-gray or darkish gray. There may be red/brown rust on the chest. Mallard female duck with 1 Extended black allelle + 1 Blue allelle= Blue. 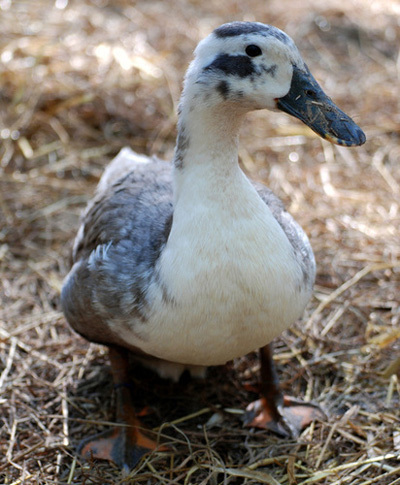 If a Blue drake and Blue female duck breed, you get black, silver and blue ducklings. To get all Blue ducklings, you need a Black drake/duck and a Silver duck/drake. Blue is incompletely dominant. One blue gene with black produces blue. Two blue genes produces silver. Sometimes a few Black feathers will show with it. This photo is a Blue female duck. See Lavender and Lilac below for other photos of Blue. Lavender is a deep purple-gray or a medium gray. It has a brown undertone. Sometimes a few Chocolate feathers will show with it. 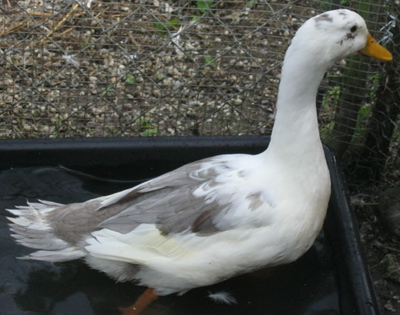 Chocolate female duck with 1 Blue allelle= Lavender. This photo is a Lavender drake enjoying a bath. Lilac is a light shade of lavender. It has a brown undertone. Sometimes a few Chocolate feathers will show with it. 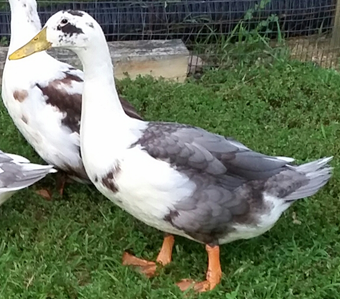 Chocolate female duck with 2 Blue allelles= Lilac. This photo is a Lilac hen with a Black duck near her and a Chocolate duck in the background. Silver is a very light gray (sort of a dilute Blue). It has a Blue undertone. The colors are sometimes scattered. It is the rarest color. Mallard female duck with 1 Extended black allelle + 2 Blue allelles= Silver. This photo is a Silver female duck. Tricolor (Pied) is any 2 colors plus white. Tricolor = no Extended Black allele + alleles of other colors. It is possible to get Tricolor from 2 pure-colored birds. They carry the colors recessively but not showing in the plumage. These photos are Tricolors. The first photo is a drake. 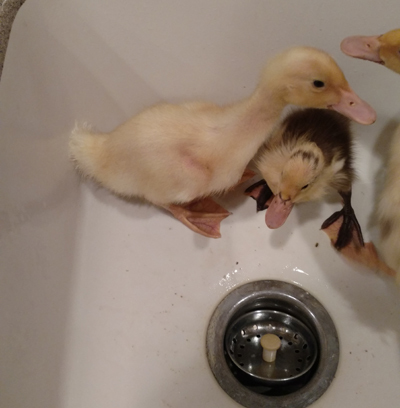 The second photo is a 6-week-old Fawn and white Tricolor duckling from Stephanie in Louisburg, North Carolina. Any color combination is possible. 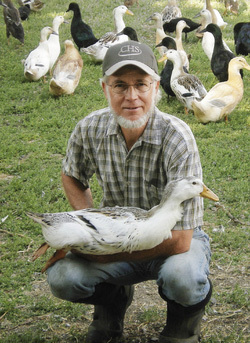 Non-standard colors come from those found in Runner ducks. 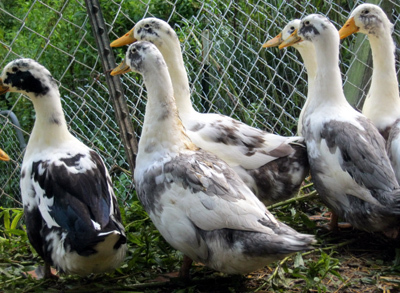 "Tricolor actually means any duck without the Extended Black gene (a throwback). 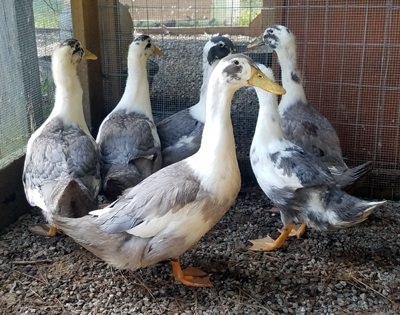 Anconas were developed using Runner ducks (who come in many patterns), and a now extinct breed of duck that carried the Extended Black gene gives you the scattered pattern. 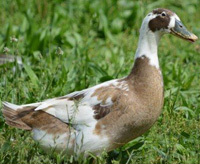 Without this Tricolor gene, any color known to occur in Mallard-dev (Mallard-derived ancestry rather than Muscovy) birds can pop up. 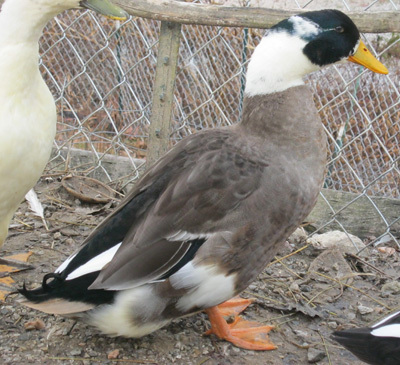 Breeding Tricolor Anconas to birds with two copies of the Extended Black gene, will give you 100% of ducklings with the wildly-marked Ancona pattern. Therefore, it is my opinion that Tricolors can work very nicely in a breeding program when used properly. 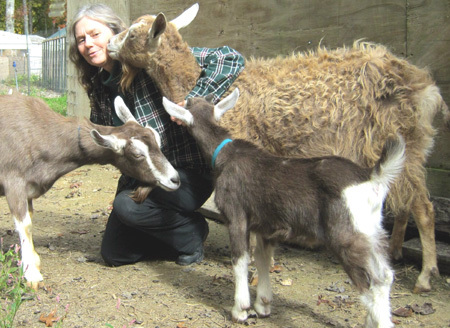 Further, I care much more about intangible traits such as foraging ability, feed conversion rate, broodiness, winter egg laying ability, growth rate of the males, etc. than I do what color the feathers are. 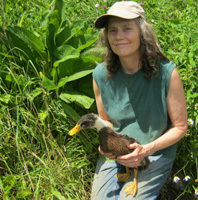 Some of the broodiest duck and best mothers I have had were Wild-type (Mallard) Tricolors. The top photo is an assortment of colors of young Ancona hatchlings. Their feather color is not fully developed yet. The darkest at the middle/top is Black. The bottom middle is Black. The bottom right is Chocolate. The Blue is the lighter, sort of gray/brown colors. There are 4 of that color. There are 5 that look almost all yellow. The Lavender does not show up much in a photo. You can see a little of it. Lilac does not show much until a duckling is around 6 weeks old. Silver does not develop very much until older than 6 weeks with full color development sometimes taking up to 8 months. The second photo is from Katherine in Urbanna, Virginia. 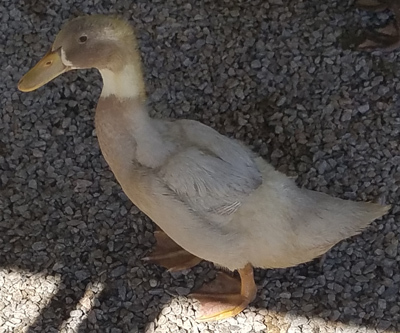 The light-colored duckling is from one of my blue-green Ancona duck eggs. 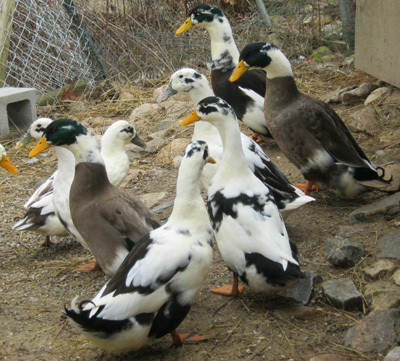 Ancona ducks have two types of white patterning that are overlaid on each other. The first pattern is a white chest, neck and horizontal line through the eye. The second is a random, patchy, splotchy, mottled pattern. 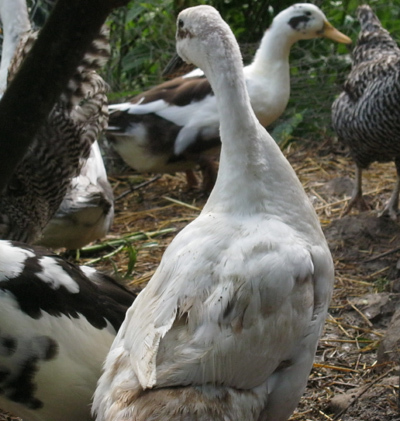 An all-white Ancona duck is possible, though rare. 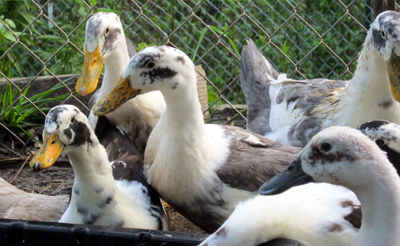 This photo is a group of all Ancona ducks. 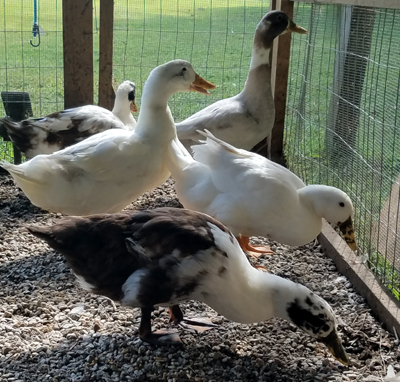 The Black ducks in the front have the mottled pattern. 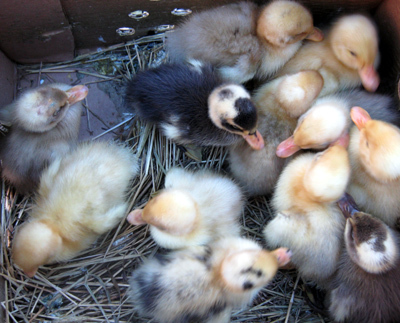 In ducklings their yellow down/feathers slowly turn white as they grow older. Rust is a characteristic of the color patterns sometimes found in Black, Blue and Chocolate. Dave Holderread's Breed Bulletin #8502: "Intermating Blacks and Chocolates normally is satisfactory. Some people think that this combination increases the occurance of rust or brown in the plumage of Blacks. Rust is a genetically controlled entity not related to Chocolate. It is true that some Chocolates do carry rust, but with no greater frequency than the Blacks." The first photo is an example of the color 'rust'. 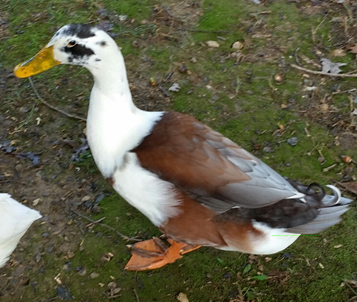 The next two photos are the same male duck. Once when he is young, and the other as an adult. "Here are pictures of the drake I kept as my 'pick of the litter'. His juvenile feathers were all blue without a trace of rust but his full adult feathers are something much different!! I've had runners over the years with small random patches of rust here or there on a blue or black colored area, but this guy turned out really cool. I've never seen anything like it. I think Dave Holderread's book says rust spreads over generations so maybe he's just a normal blue and white with a multi-generational accumulation of rust areas but it's so widespread and symmetrical that I question whether it's really simply rust. I was actually planning on making this guy into dinner until the day I noticed the rust coloring because to my eye he is a little too long in the bill, neck and body for correct Ancona proportions. But he did have a good disposition with the hens. So his color saved him long enough for his personality to make him my keeper drake in the end. He's been great. Black = base (basic) color. Chocolate (medium brown) = Black + Chocolate allele. Buff (light Chocolate) = Chocolate + Buff allele. Blue (blue gray) = Black + Blue allelle. Lavender (purple gray) = Chocolate + 1 Blue allele. Lilac (light Lavender) = Chocolate + 2 Blue alleles. Silver (very light gray) = Black + 2 Blue alleles. This link is a transcript from an audio tape of David Holderread discussing Ancona genetics. This is a somewhat complicated discussion for Ancona duck enthusiasts. David is a waterfowl expert. "We ordered eggs from you last year and hatched 5 ducks. This year, we hatched 6 more ducklings from eggs our original ones laid. I'm including a pic of the original ones, as the colors in the new ducks look nothing like the older ducks. Recessive genes, I'm certain." 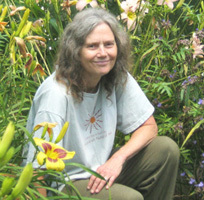 -Stephanie, Louisburg, North Carolina. The first photo is the parents. The second photo is the children. Very interesting. These 2 photos are from Stephanie.